Wow~ that's a lot of balls bouncing down the staircase! After watching the video and if you are wondering; which I am sure you are, what is Play it Forward as shown at the end of the video, you can head off to their event page over here or read further and let me share with you some more details. 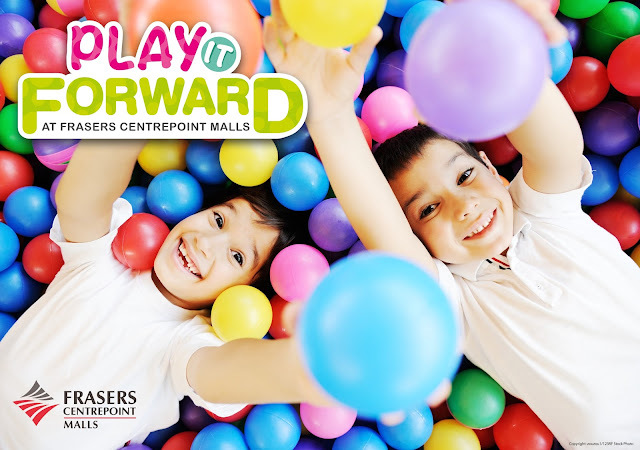 Play it Forward is a year-long initiative organised by Frasers Centrepoint Malls in partnership with Community Chest. It aims to raise funds for Family Service Centres which provide social support for families facing difficulties. Frasers Centrepoint Mall introduces Singapore’s first charity ball pool event – Play it Forward, spanning at 64m2 or four fifth the size of a badminton court, the ball pool offers both adults and children a chance to dive in, unwind, de-stress and play in an “endless” colourful sea of balls. A minimum donation of S$5 gives you 15 mins of play in the ball pool. Frasers Centrepoint Malls matches every donation dollar-for-dollar for up to S$30,000. Under the Care & Share Movement, total donations from now till 31 March 2016 will also be matched dollar-for-dollar by the Government. This means S$20 raised in total for every $5 donated! 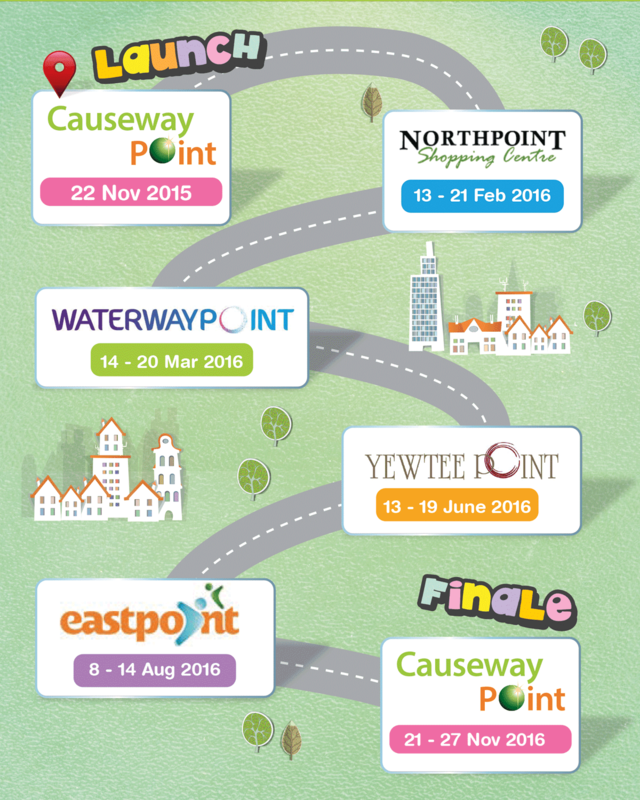 The first run takes place on 22 November 2015 at Causeway Point, Central Atrium (Level 1) from 10am to 10pm. Don't be disappointed if Causeway Point is too far away from you because Frasers Centrepoint Mall wants to reach out to more people so the Ball Pool will be making its round around their malls. So mark down the dates where the Play it Forward Ball Pool will be in your neighbourhood, come on down to have a ballastic time! To further spread the Christmas cheer, participants that day will also stand to win $10,000 worth of prizes sponsored by generous retailers from Causeway Point. * Registration slots are available in 15-minute intervals, on a first-come-first-served basis. * For safety reasons, only a maximum of 30 participants may be in the ball pool at any one time. * All participants will be required to sign an indemnity before entering the ball pool. * As much as we value your support, participants feeling unwell will be requested not to enter the pool. * All footwear, accessories, valuables and loose items including, but not restricted to handphones, cameras, jewelleries and any electronic devices must be removed before entering the pool. Any valuables brought within the pool will be at owner’s own discretion. * Children below 90cm will require adult accompaniment, and will count as 2 registration participants with a minimum of $10 donations. Parents/ guardian of children below 12 years of age are to be within the immediate vicinity to ensure safety of the child if the parent/ guardian is not participating in the ball pool. * All donations made to Community Chest through this programme are not entitled to tax exempt status. * All donations made at the point of registration will not be returnable and registered participants will not be able to change their time slots. * All participants or their guardians must ensure their own safety, and of others in the ball pool. * Frasers Centrepoint Malls and its agencies will not be responsible for any injury, loss or other complications arising from the use of the ball pool. * Safety marshals will be on hand to maintain safety, and reserve the right to stop any participants who engage in reckless, dangerous, or abusive behaviour, including ordering any participant to exit the ball pool at any point in time without recompense. * No food and drinks are to be allowed within the ball pool. So, anything to do with PLAY and FUN, you bet The DinoFamily will be all in for it, and for this meaningful play event we will definitely be there! Frasers Centrepoint Malls is so kind to invite us to play at the Play it Forward Ball Pool on 22 November 2015. That's not all, they are extending the invite to 5 of my readers and their little one to jump into the ball pool with us! On top of that, they have sponsored x5 SGD20 FCM gift cards to these 5 lucky readers too! Thank you Frasers Centrepoint Malls! An important things to note before you enter this giveaway. #1 You MUST be able to make it to Causeway Point on 22 November 2015 @ 10am. #2 To be fair for every one, I am giving 2 tickets to each family, this means an adult and a child gets to play in the Ball Pool together with me. #3 Even though Frasers Centrepoint Malls invited us to Play it Forward without having to make the $5 donation, we STRONGLY suggest that a donation of that equivalent or higher value be made, after all this is for a good cause right? Prize : 5 winners to win a pairs of Play it Forward pass on 22 November 2015 @ 10am at Causeway Point and a SGD20 FCM Gift Cards each! Beanie N Us, A Juggling Mom and Dinomama are pleased to bring to you a series of giveaways leading into December! Please remember to share and like our pages to keep abreast of our giveaway lineup! Yes I am able to make it on the 22nd Nov 2015 at 10am with my child. Yes! I would be able to attend! Yes I am able to make it on the 22nd Nov 2015! Yes I will be free to attend.. Yes, of course we can make it on 22nd Nov at 10am!!!! Yes will be free to attend! Yes I am able to make it wif my child!!! Yes I am able to make it on 22nd Nov.